This reintegrates 12 minutes of deleted footage into the movie (including more songs from the musical and homages to the 1968 film). With 12 minutes of deleted footage reintegrated into the movie (including more songs from the musical and homages to the 1968 film) and a 5.1 surround soundtrack, this is even better than seeing The Producers on Broadway! Several scenes were seamlessly integrated into the movie. 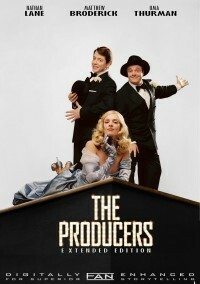 I have fond memories of the 2005 stage-to-film adaptation of THE PRODUCERS. I understand it didn't receive great reviews, but I find it a great way to see Nathan Lane and Matthew Broderick in a wonderful show I never would have had the chance to see otherwise. In this extended cut, the best addition is the song that introduces Max Bialystock, “The King of Broadway.” Why it was originally cut from the film I don’t know, but its reinsertion provides some welcome energy, excitement and exposition right at the start of the story. Other good additions: a version of “Along Came Bialy” with comedic vignettes of Max romancing old ladies, and an appearance of “You'll Find Your Happiness in Rio” that hints at the fuller version of the song later and also reunites Broderick and Lane with Ernie Sabella (respectively the voices of Simba, Timon and Pumbaa in THE LION KING). The rest of the reinsertions – including “In Old Bavaria” and reprises of “Der Guten Tag Hop-Clop” and “That Face” – I found nonessential, but they’re nice to have. The editing is good. I was particularly impressed by the matching of audio levels between deleted scenes and the original film. For me, the only thing that didn't work was the extra accountant’s verse in “I Wanna Be a Producer.” The reinsertion of this bit is limited by the footage available, so an earlier shot is repeated and two cross dissolves are used in rapid succession. I would have rather this was left out instead of being reinserted so awkwardly (the verse isn’t very funny anyway). Video quality is solid, though deleted scenes are noticeably lower quality (not the editor’s fault). Audio quality is just fine, except for the sound dropping momentarily around the 12 minute mark (not sure if this is present in the source, I haven’t checked my DVD to compare, but I thought I’d mention it). There's nothing like a show on Broadway, but unless you can see one, the film version will do. This extended edition gives you even more of that PRODUCERS magic. Recommended. This was superb!!! The editing and DVD presentation were top notch. Beautiful menus, and seamless integration of the extra scenes. Thanks wmgan! !